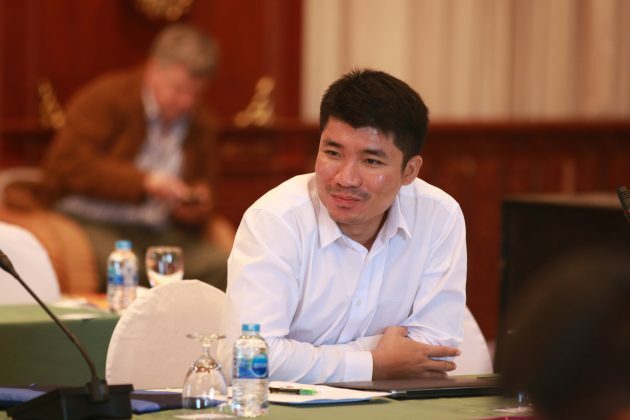 In an exclusive interview with Karen News, Twan Zaw, the United Nationalities Federal Council’s Joint General Secretary (1) and general secretary of Arakan National Council, discusses the importance of ethnic unity as Burma Army offensives continue to batter villagers in the north of the country. We are totally concerned about the northern fighting, mainly with the members of the UNFC. We have already negotiated with the government for several months to stop fighting, that’s how we developed the so call nationwide ceasefire agreement. We all were deeply involved in the drafting process, so finally the Tatmadaw [Burma’s military] didn’t allow the all inclusiveness, so that’s why the northern groups are now currently facing the Burma Army’s massive offensive on the ground. Being unrecognized by the government, that’s the root cause of the ethnic conflicts. As a consequence, it’s a tragedy, as the people are suffering because of the air strikes by the Burma military. We had already discussed with Daw Aung San Suu Kyi after she took office, and at the same time, we negotiated with her representative – the peace commission and their delegation, we just talked informally recently in Chiang Mai – the peace commission will bring the results to their superiors. It’s not two sides fighting, that’s why we call the ethnic armed groups, a resistance movement. We are stationary and living in our own territory, the Burma Army comes and attacks us, we didn’t go and attack them. It is a shock for the ethnic people to be attacked by helicopter gunships and jet planes, that’s why it is very difficult for us to understand the Tatmadaw, it’s military motivation and why they have a strong ambition to control over the territory of the ethnic armed organizations? The use of this force has seen hundreds of thousands of refugees flee their villages along the Chinese-Burma border. China has not allowed them to enter into their territory. They have been moved back and now they are in very difficult position. Considering the people’s suffering, we are trying our best to solve this problem at the negotiating table. At the same time, we’ve been resisting the Tatmadaw offensive on the ground even though they are using the militarily offensive the heavy artillery, tanks and helicopter gunships and jet fighters – it’s not like a civil war – it’s more than that. In recent weeks [January] Pa-Laung village was attacked by the Burma Army. They used heavy artillery to shell the village, two people including a child died and. over 10 people were seriously injured. Villagers have no protection against the Burmese Army they blame the ethic armed organizations. They accused the Ta-an National Liberation Army and the KIA, but, when we examine the shells, we can see they’re not what is used by the ethnic armed organizations. Getting aid to the people is not allowed by the government. They know foreign or domestic aid is for humanitarian purposes. Recently, the UN’s human rights special reporter, Miss Yanhee Lee was not allowed to enter into the KIA administered zone, where there are refugee camps, she wanted to see and visit the sites and the camp, but she wasn’t allowed. They are clearly blocking humanitarian assistants. It’s not really the government labeling the ethnic armed organisations as terrorists, it’s the Tatmadaw. People noticed that in the union parliament, they are against it, they didn’t vote. But, the military tried to get the resolution passed at the state level parliament in Shan state. The Shan state parliament passed it, they [military] won it, they succeeded. Now we are being classified as terrorists. The state run papers managed by the government, the ministry of information does not use the term, but the Burma Army controlled newspapers, such as Myawaddy, it’s a different, they are using the term terrorist. At the same time, the government papers, the New Light of Myanmar and Kyay Mone are avoiding using that term. The UNFC policy is to solve the fundamental problem of this country and that is the political problem. It must be solved by the political means. This is our common policy and principle. It’s been long time. Why we took up arms against the Tatmadaw is that we had no opportunity to solve the problems peacefully on the negotiating table. If there a chance and the opportunity to have negotiations, we are ready to talk. Our country’s problem is fundamentally a political problem. The Tatmadaw does not respect the ethnic groups and that’s why our problem is prolonging. Because of that we do not have a mutual understanding and the recognition for each other. That’s the tragedy among us – it affects attempts at national reconciliation. It’s tough to have trust in the current situation, as the Burma military wants to keep fighting and use helicopters to attack villagers. Their behavior, the military offensives on the ground is totally opposite to the desire of the people. The public is demanding peace. They are longing for peace. We, the ethnic armed groups also want peace, but the Burma military’s commitment is totally different. We are in talks at the moment with the government but they didn’t change their policy, they didn’t accept the all inclusiveness, that’s the problem. We want all stakeholders to be involved in the process. We drafted the so-called Nationwide Ceasefire Agreement, we have 16 members. There are 16 members, but they only recognize 10, so there’s the problem. We communicate. We have good relationships so far. Last July we had a plenary meeting at a KIO administered area, Mai Ja Yang. Unfortunately, the eight groups who signed the NCA, makes it a little difficult for us all to move together. It’s a clever tactic by the government’s military strategists to divide our groups into two factions. It’s a clever strategy by them. We didn’t expect the Nationwide Ceasefire Agreement to be used as a tool to divide us. But, it did happen. The NCA became a tool to divide us. We didn’t expect that. So, as long as the government or Tatmadaw [Burma’s military] is using the NCA as a tool to divide us, there won’t be peace in the country. It is a severe blow to ethnic aspirations to be divided. Because of divisions that split ethnic unity we suffered a lot in the past. The rulers divided us and its divide and rule policy, that they inherited from the British they are still using it and it seems to be working. Even though we are consciously aware and trying to respond it still happens. We have to confess that it is a weakness of the ethnic nationalities. We have to try to change it into a strength. Armed and unarmed, we are trying to be united. It’s not good for the country’s future as long as the ethnic organisations, over 60 percent of the population, are divided. The ethnic issue is a blind spot for the international community. The fighting in the north is serious. We are seeing gunships and thousands of the government soldiers being used. We are seeing thousands of displaced people and yet there’re not really a great deal of outrage coming from the international community. The current administration, the union parliament in Naypyitaw, decided to give more budget to the Tatmadaw demands. The Burma Army, gets the maximum, the majority of the budget of the country and they still ask for more. It is clear that Daw Aung San Suu Kyi and the commander-in-chief have agreed to compromise. She is caught in a hard place, the military through the constitution has really limited her political strength. All are working under the problematic constitution. That’s why these kinds of chaotic situations are not straight. And constitution weakens the NLD government’s politic strength. Their policy is to change the constitution, to change the system. Now they are in, she is in her second year. They have almost three years left. If they cannot conduct or fulfil their promises to the people, changing the constitution. It will affect badly on them. The internationally community removed the sanctions too early I think. The Obama administration strongly emphasize the success of its foreign policy, but it didn’t meet the reality. The arms embargo remains, even though they lifted the economic sanctions. The armed embargo still affects the Burma Army. The people are suffering from the fighting. It is constantly happening and widespread. The international community should review the situation and that of its sanctions. The international community should be tougher on Burma. There is the huge imbalance in the international community’s approach to our country’s situation. The international community mainly focuses on their business ties and their own national interest. Going through government to government, the traditional way of diplomatic relationship. This approach marginalizes the ethnic population in our country. it is difficult to understand the diplomatic language when our people have been suffering for decades without change.